Many children today have grown up with technology to such an extent that they can’t imagine an existence without computers and touchscreens . As a father, it’s your responsibility to teach your kid that there is more to life than just staring at a screen, even if you have to take some unconventional ways to get there. 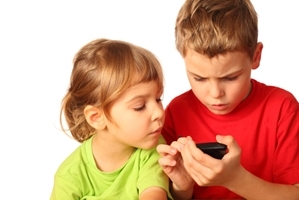 Check out these three tips to get your kid’s attention away from the smartphone or tablet. Establish ‘no phone’ times: Unlike computers, smartphones can be taken anywhere at anytime. During family moments like dinner, these devices can intrude on special times between you and your kid. Tell him or her to put the smartphone away when at the dinner table, or drop it into a special “no phone” box that holds it until the meal is done. Make him or her pay: So many people have incredibly advanced smartphones today that your kid may take it for granted that he or she gets to have one. However, having your kid pay some or all of the phone bill may help him or her realize how much data and screen time they use each month.